This is a beautiful four bedroom, 2-bathroom townhouse with open floor plan built in 2005. This home offers 1360 square feet, a back yard, and low maintenance. Also included in this home are carpeting, laminate flooring, electric baseboard heat, window coverings, smoke detectors, and a security system. Association fees are less than $250 per month and include exterior and grounds maintenance, snow removal, refuse, sewer, and water. This home is very affordable with low taxes and financing terms available in cash or Conventional, FHA, or VA loans. The open kitchen/living area offers a beautiful island/breakfast bar and a slider to the backyard. The living room has carpeting, window coverings, and cable TV. There is also laminated flooring inside the front door entryway. 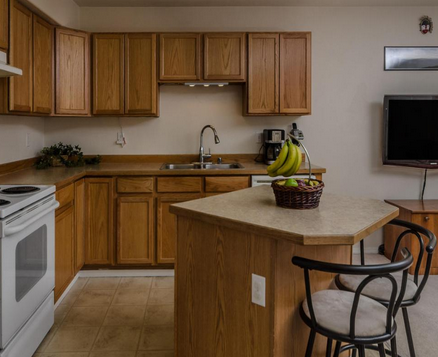 The L-shaped kitchen has beautiful light wood cabinets, white appliances, laminate flooring, and garbage disposal. The appliances are white with a large side-by-side refrigerator, electric stove, and dishwasher. Also on the main floor is a full bath and bedroom. This bedroom is great as a guest room or home office. The carpeted bedroom includes a roomy closet for clothing and storage. The bathroom has laminate flooring, vanity sink, and a large mirror with bright lighting. The second floor of this amazing townhouse offers three bedrooms and one bath. Also included on this floor is a laundry room and linen closet just outside the bathroom. The master bedroom is spacious with window coverings, a large walk-in closet, and carpeting. The other three bedrooms are bright, carpeted, and all three have roomy closets for clothing and storage. The full bath has laminate flooring, large lighted mirror, and vanity style sink. The laundry room has a shelf for storage and room for a large washer and dryer with all hook ups included. 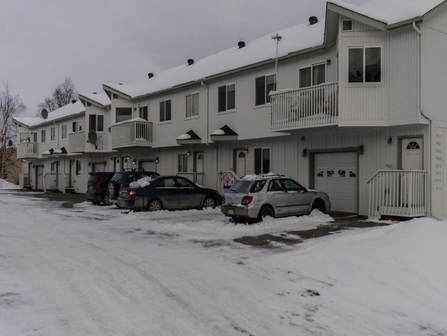 This town home is a great buy and has been well maintained and cared for. Located in the region of south central Alaska there are beautiful views. Homeowners will find this home is convenient to shopping, restaurants, and schools. Shops, restaurants, and main highways are conveniently located close to this home. The elementary, middle, and high schools are less than three miles away from this home as well. For the new home buyer who is looking for a low maintenance option this home is perfect. The association fees include exterior maintenance, grounds maintenance, and snow removal. This means no plowing and shoveling snow, no mowing the lawn, and no outside home repairs, these tasks are taken care of for the new owner. Association fees also include refuse, water, and sewer for added convenience. Included inside the home is a security system and smoke detectors to help protect the home from fires and intruders. The home also comes with window coverings, laminate flooring in the kitchen and bathrooms, and carpeting throughout the rest of the home. With all these conveniences this home is a great buy for families or couples. For more information of to schedule a showing, visit our Contact Us page or call our offices directly at (907) 865-6543.